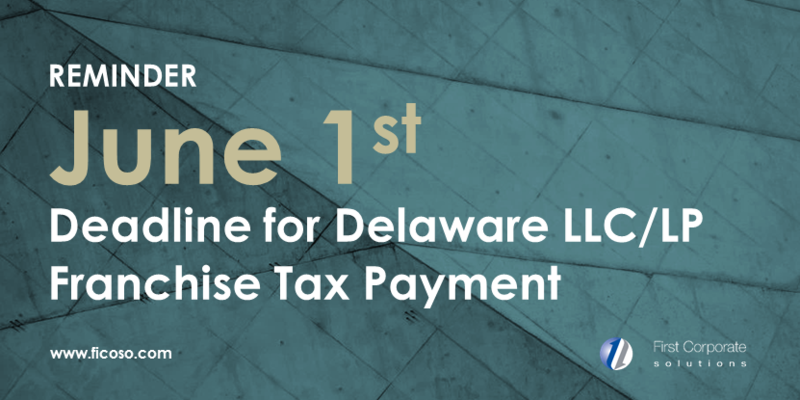 Every June 1st all Delaware LLC/LP’s registered to do business are required to pay their $300 annual Franchise Taxes with the Secretary of State’s office for the 2016 calendar year. Failure to make this payment by the end of business June 1 will result in a $200 penalty the very next day as well as interest accruing at 1.5% monthly until payment is made. If non-payment persists, the Secretary of State will revoke your entity causing additional fees and paperwork to be filed. Cancelling prior will still require the 2016 payment and a payment for the current 2017 period. FCS can assist with coordinating this payment on a regular basis, or clients can choose to have us proactively manage the process so you can focus on more pressing business functions. Please contact our Legal Services Division for assistance with any questions at 844.392.7488 or raservices@ficoso.com.